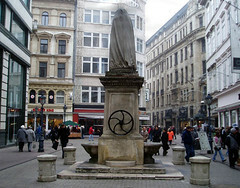 It took me ages to figure out this statue in Kristóf Tér was covered with a tarpaulin. I thought it was one of those shroud-type deals you sometimes see in cemeteries. Still doesn't explain the big wheel on the side. Yes it does turn, to no apparent purpose.